Reveal works strategically for Somerset’s visual arts and media and is a partnership between Somerset Art Works, Brewhouse Visual Arts and Somerset Film. 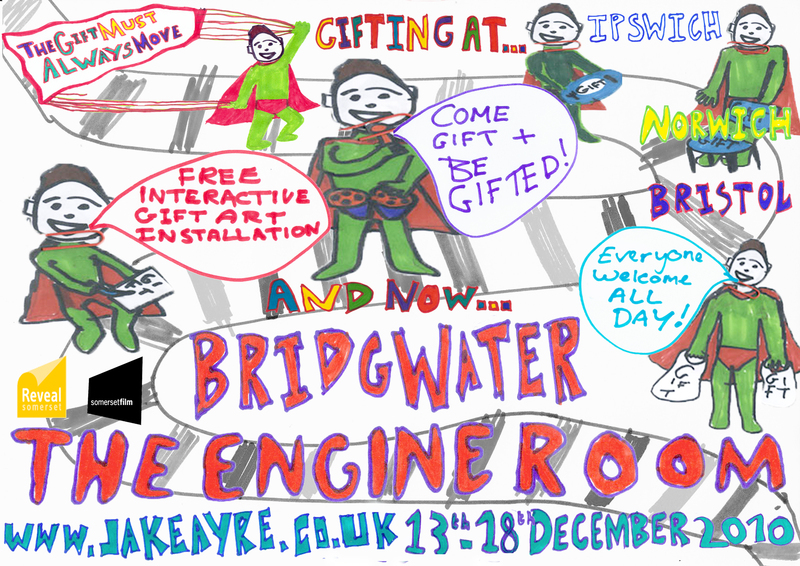 Would you like to create a piece of sound and moving image based multi-screen work and show it in the Bridgwater Engine Room studio between 5 and 10 December? The award is intended for up-and-coming digital artist/film-makers and comprises £500 and the exclusive use of our studio and selected equipment for a three day build and a five day show which we will widely publicise. Entries have to be with us by 12 noon on Friday 28 October. Phil Shepherd, Facilitator for Somerset Film, says “Reveal works strategically across the county to raise the profile of the visual and digital arts in the county. 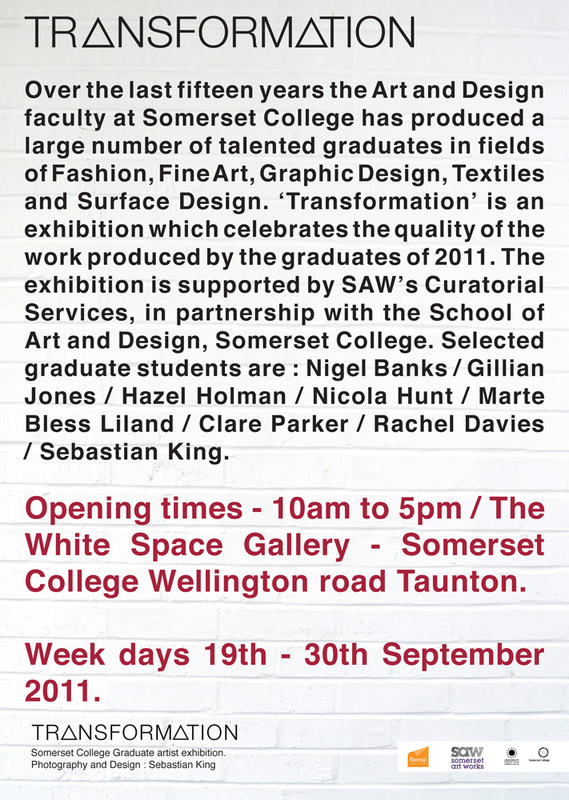 For a lot of people here and across rural Somerset contemporary work is rarely available. Along with projects like the recent Night of Light at Hestercombe Gardens the Innovation award is part of addressing that deficit. In essence it’s about making a piece of imaginative and inspiring work using the assets of the Engine Room to be supported by our studio manager and crew. Following the success of Jake Ayres’s ‘gifting’ project at the Engine Room last year (see archive) we are again looking for a truly innovative piece of work – in any media, single or multiple – video, photography, sound, games – offline or online – which pushes boundaries, challenges preconceptions of what digital art is all about – and above all engages with the wider public. Let us have your ideas, surprise us with your audacity and fresh approach, we’re looking for something that may challenge, may amuse, may take us out of our comfort zones but above all we want a work that truly engages, that opens conversations in all sorts of people’s heads, that is accessible without being patronising, that reminds us how art can change people’s lives. There are very few caveats – it’s got to be legal and achievable using the kit we can offer and the £500 expenses available. It’s got to fit our building without impeding the café trade and upsetting the neighbours! There may or may not be some space available outside the building depending on what you want to do. There is just one award available but could be given to a small team if it’s the idea we think will work best. You might want well to get in touch to discuss your initial idea before submitting something to us but this is not a pre-requirement. You almost certainly need at least to know the geography of our site and probably the ‘feel’ of the place also. Let’s start the conversation soon, get in touch as you need to get your ideas to us on two sheets of A4 max (email is fine) with CV by 12 noon on 28th October latest. Please note – absolutely no previous experience is necessary to apply for this award, if you don’t even have a CV, still apply! Reveal are currently developing a series of digital media hubs to compliment The Engine Room in Bridgwater. The Langport Reveal Hub, based at Somerset Art Works offices, is in development. More information to follow. The Reveal Media Hub, based at The Brewhouse Theatre and Arts Centre in Taunton is now open. To find out how to get involved contact the Engine Room on 01278 433187. 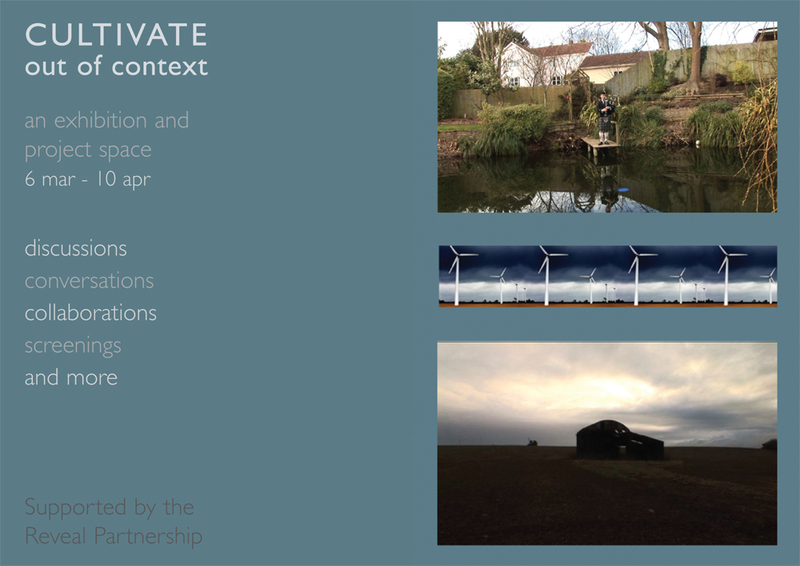 Reveal Somerset seeks artists for ‘Cultivate – Out of Context’ – an opportunity to co-develop digital work for exhibition and broadcast during March/early April on the theme of ‘art and location’. We will work with artists who are interested in developing and sharing their creative practice with others in order to extend debate and support contemporary practice in the county. We will use the Reveal Media Hub at The Brewhouse Theatre and Arts Centre in Taunton to offer support in digital and time-based media to participants on the programme. We will use the web to build links with artist led groups in other countries to share practice, build relationships and explore the theme of ‘art and location’. ‘Out of Context’ is open to any artist working or based in Somerset who is currently practicing in any media who would like the opportunity of engaging in critical dialogue using digital media. There will be support from the Reveal partners as well as a digital technician. We are pleased to announce that painter Kitty Hillier has been awarded the Reveal Emerging Artists Award for 2009. This award aims to support an emerging artist who is either launching their professional career or taking their established career in a new direction. Artist Kitty Hillier will be offered a solo exhibition hosted by a Somerset venue during 2010. Jon England, winner of last years Reveal award, exhibited his moving exhibition ‘Afterglow’ in The Brewhouse Gallery during Oct/Nov 2009. On 11th Nov, Remembrance Day, many people joined the artist to observe 2 min silence at 11am. Reveal visual arts and digital media bursaries. The fourth in the series of empty shop bursaries can now be seen in Taunton. Jenny Graham’s work ‘BOGOF’ can be seen on the High Street, next to ‘Past Times’. We are pleased to announce that four artists have been awarded bursaries to work in empty shops this autumn – they are: Andrew Bolton, Becky Buchanan, John Dummett and Jenny Graham. They will be working in Shepton Mallet, Chard, Bridgwater and Taunton respectively. Andrew Bolton’s work can now be seen in Shepton Mallet town centre. His work refers specifically to empty shops in that it refers to the blocking out of the windows that often happens when a tenant leaves. Life sized drawings of activity in the shop will be made on paper in the windows. Passers-by will be invited to be involved in this. Some areas of the drawing will be cut away to allow imagery from inside the shop to show through. If possible, these will be the actual objects (shop fittings etc) left inside the building that relate to the former use of the shop. More will follow shortly. I aim to work in collaboration with pupils at Chard’s Comprehensive: Holyrood Community School. I feel that this would be an ideal opportunity to tap into the enthusiasm and creativity of a new generation of Chard inhabitants, and I believe that together we could generate some exciting and thought provoking work. In doing this I hope the pupils will nurture a sense of ownership and pride in their surroundings; a feeling which I hope will filter down to parents, relatives and friends. In addition to a collaborative body of work, I also aim to produce an individual piece of artwork, which I would exhibit alongside. For this proposed new work John Dummett aims to build upon a recent project; scribble space. Scribble space was a gallery installation with off-site guided walks, this work questioned the rhetoric of green spaces and expanded the debates and assumptions that inform how we understand and value urban green space. For Reveal he intends to focus on these ideas and specifically the notion of stewardship in relation to green sites in Bridgwater. The project will be developed through a cumulative installation located in a vacant shop unit and an off-site process. The shop unit will contain an ‘inventory’ of neglected spaces, presented as large format digital photographs annotated with text and video footage of the sites. The photographs will be used as a writing surface to record how we understand and value urban green spaces. These writing sessions would be programmed as informal one day drop in sessions, for invited and interested members of the public. Jenny Graham aims to celebrate the social and environmental importance of independent retailers in Somerset who provide a personal relationship with the community and promote local goods and services by creating a series of digital photo-montages of these traders and their premises in the area. The ‘Reveal’ bursaries aim to help support artists to make work for showcasing in high visibility spaces, in particular as part of ’empty shop’ initiatives across the county of Somerset. The aim is to support an artist in each of the five districts. The vitality of our village and town centres is key to the future sustainability of these places. ‘Reveal’ is keen to support the role artists can play with creative opportunities in difficult times. Each of the 5 bursaries will be awarded £200 (We hope that good proposals will attract additional match funding). In addition the Reveal partnership and a Somerset Arts Promoter will support each artist. Additional production support will be on hand at the ‘Reveal’ hubs in Bridgwater, Langport and Taunton. 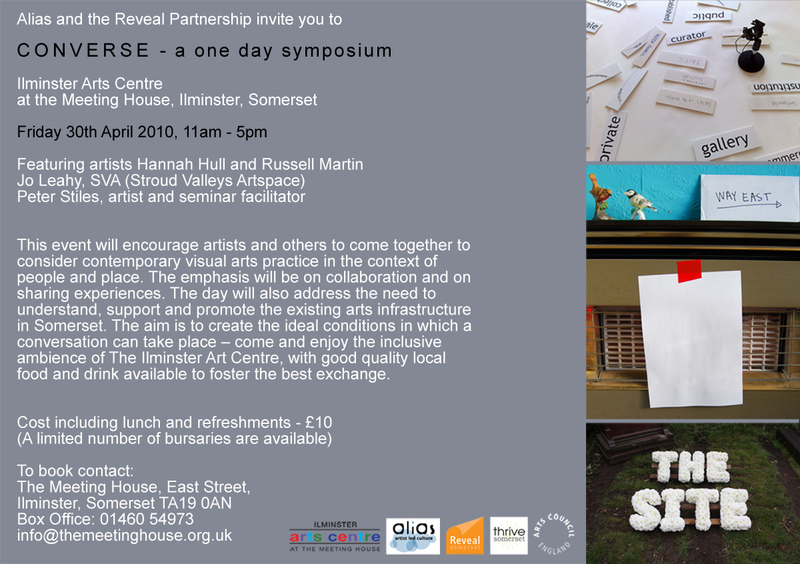 We would like the work to be showcased in November 2009 as part of a planned ‘Reveal’ Symposium. Somerset Art Works, Brewhouse Visual Arts and Somerset Film have joined forces with Fuse Performance to create a concept which references the county’s early history of flooding and symbolises collaboration for collective benefit. Called ARK, it will itself challenge designers everywhere with an international competition to create an eco-sensitive form, borrowed from legend and made relevant by the collaborative spirit and enhanced social awareness promoted by the Olympic spirit. 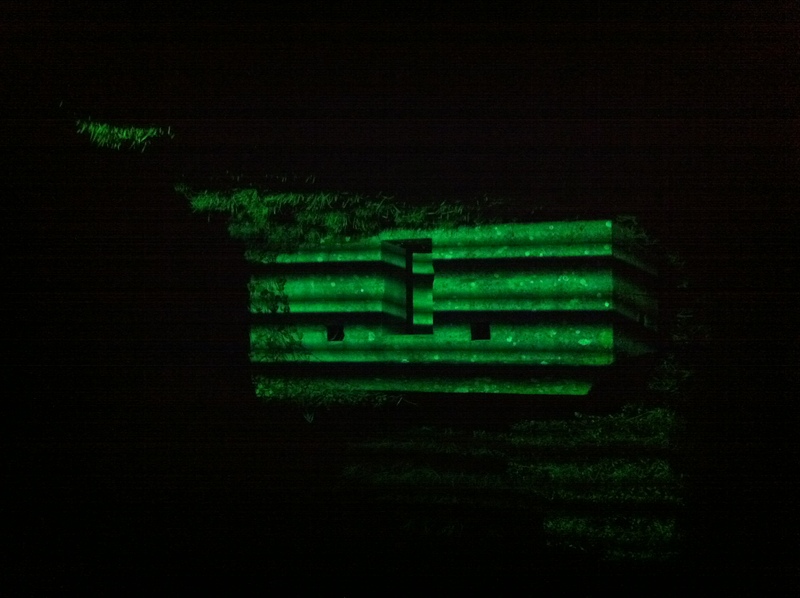 ARK is being developed as part of Somerset’s Cultural Olympiad Quest for 2012. See description below. We want to make an artwork that is DYNAMIC, a CATALYST for creative activity and positive change, an artwork that is CHALLENGING in concept and form, a work for and with PEOPLE. At a time when we are increasingly in a state of flux we will build an ARK, an exquisite dynamic form of human scale, a positive expression of the aspirations of the communities with which it interacts. The ARK will be both a symbol for reflection and an inspirational space, accessible to all, transformable for different purposes in different locations. Joyful to behold, nimble in spirit and form, the ARK will signal a commitment to the future. We will send out a SOS in the form of an international design competition and will construct the ARK in Somerset – the centre of the South West region – using the latest environmental and technological expertise. The ARK will bring together a wide range of people from concept to construction. The ARK will have international reach through the profile of the selected design team and provide a platform for the global sharing of local distinctiveness. Creative, progressive, participative, the ARK will implicitly question our relationship to the land, to water and to the challenges of climate change – providing a catalyst for response. It will blur the boundaries between vessels, buildings and landscape, be able to respond to the diverse contexts in which it is placed. The identity of the ARK reflects the importance of its place in different cultures and religions, an enduring myth relevant to all of us today. The ARK’s journey through the region and in 2012 the Olympic path will connect people of all ages, cultures, and backgrounds through real and virtual networks. Already the exploration of the initial idea has brought young people from Somerset together with artists, makers and facilitators in energetic dialogue. As a symbol / celebration of human creativity programming the ARK will be rooted in international, national and local contexts, exploring Olympiad values as well as celebrating local ingenuity. Moving the ARK will harness community involvement and commitment, embracing both spirit and practice of collective effort and co-operation. Local stories, universal themes. The physical form of ARK has yet to emerge, but the concept is clear. The ARK is a gauntlet thrown down, a project that speaks of our times. During Somerset Art Weeks this September Jon England opened his studio at Durston, Near Taunton. His site-specific installation at ‘HUT 27’ explored Somerset’s WWII heritage and in particular the unexpected links he found between Somerset and ‘The Great Escape’. Using media such as poppy seeds and varnish on board, dried milk powder on paper, etched glass and motorised projection he explored the factual and the filmic ‘great escape’. The ‘Reveal’ partners of Somerset Art Works, Somerset Film and the Brewhouse Visual Arts were delighted to offer Jon the award after visiting all the studios of those artists nominated from across the county. Jon England, who studied at Central St Martin’s before returning to Somerset to live and work two years ago, will receive a solo exhibition in the Brewhouse Gallery at the Brewhouse Theatre and Arts Centre in the autumn of 2009. Tuesday 9th September, 7.30pm at The Engine Room, 52 High Street, Bridgwater, Somerset. Guest speakers included Angus Farquhar, Creative Director of internationally renowned NVA, Glasgow. Thursday 18th September, 6.30pm at The Brewhouse Theatre and Arts Centre, Coal Orchard, Taunton, Somerset. Guest speakers included artist Karen Guthrie, co-winner of the Northern Art Prize 2008. 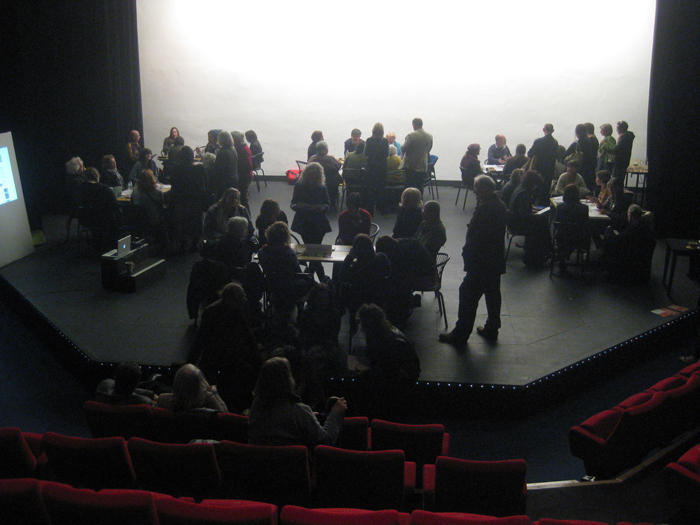 These events facilitated by Somerset Art Works, Somerset Film and Brewhouse Visual Arts aimed to create dialogue on such areas as: developing and raising the profile of visual arts and media in the county; developing audiences; considering sustainability, etc. During Somerset Art Weeks The Brewhouse Theatre and Arts Centre in association with Somerset Art Works and Somerset film will award a solo exhibition to an emerging artist who is either launching their career or taking their established career in a new direction. If you would like to nominate an artist for selection please email tim.martiATthebrewhouse.net The winner will be announced at the Reveal Somerset event on the 18th September – please see above. 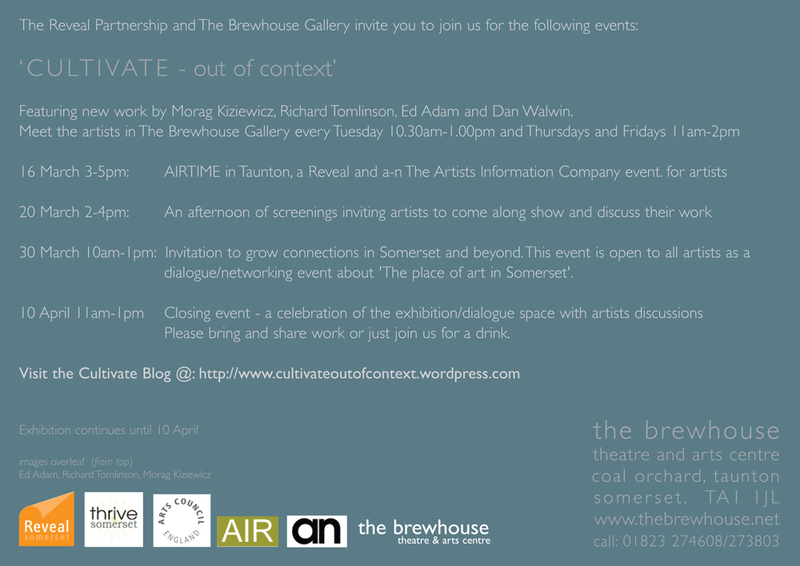 The fourth in a series of ‘Reveal’ events across Somerset aimed at exploring the future development of visual arts and media across the county. The evening featured guest speakers international artist Matt Stokes winner of ‘Becks Futures’ in 2006 who will shortly be working with ‘Foreground’ in Frome and Helen Ottaway of Artmusic who are currently working on a new commission for MAC in Birmingham. There was then an opportunity to hear from local artists, organisations and local businesses. Discussions highlighted the need for local forums, coordinated approaches to fund raising and information sharing. Time was spent with artists and organisations updating one another on their current work and situations. Reveal invited Locus+, based in Newcastle, to spend some time with us to look at co-comissioning a new piece of international work that feeds in to the Reveal agenda. Discussions are on going as to the nature of this commission. Watch this space. For further info on Andrew Bolton’s empty shop work please click on the Bursaries tab above. Jon England’s outstanding exhibition ‘Afterglow’, can now be seen in the Brewhouse Gallery, Taunton. Click on Awards above for further information. On Tuesday 16th March, Reveal partnered AIR/a-n to run an AIRTIME event. 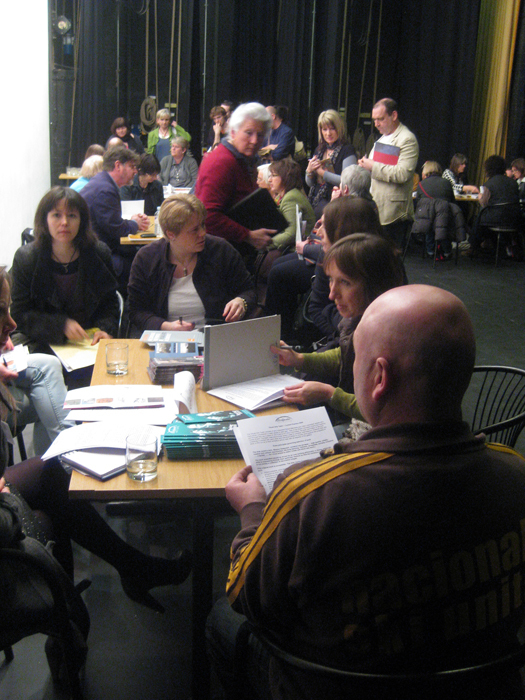 70 Artists had the opportunity of talking to representatives from arts organisations from across the county as well as regional and national bodies such as Alias, DACS, a-n, etc. The last Reveal event was the ‘Converse’ symposium on 30th April at The Ilminster Art Centre, this event drew 30 artists and arts professionals to come and discuss practice in Somerset with Alias and our guest speakers. More to follow soon. Although the Cultivate exhibition has now ended the artists are continuing to meet and add to their blog. The Reveal Partnership are currently working on several events and exhibitions for the coming few months. As part of Somerset Art Weeks we are supporting ‘Artists at Work’, three new commissions by Mark Parry, Bronwen Bradshaw and Kate Noble that focus on artists’ practice in Somerset. On 6th October at 6pm the artists will discuss the project as part of an ‘Artists’ Dialogue’ session. Also as part of SAW Kitty Hillier, Reveal Emerging Artists Award winner, will be showing her work at the Black Swan in Frome. On the 23rd September at 6pm she will be giving a talk about her work alongside Jon England and Laura Rouse. Would you like to create a piece of sound and moving image based multi-screen work and show it in the Engine Room studio between 13 and 17 December? The award is intended for up-and-coming digital artist/film-makers and comprises £500 and the exclusive use of our studio and selected equipment for a three day build and a five day show which we will widely publicise. Entries have to be with us by 12 noon on Friday 8 October. Phil Shepherd, Facilitator for Somerset Film, says “Reveal works strategically across the county but till now has only been occasionally visible ‘on the ground’ in Bridgwater. For a lot of people here and across rural Somerset contemporary work is rarely available. The Innovation award addresses that and is all about making a piece of imaginative and inspiring work using the assets of the Engine Room to be supported by our studio manager and crew. We are looking for a truly innovative piece of work – in any media, single or multiple – video, photography, sound, games – offline or online – which pushes boundaries, challenges preconceptions of what digital art is all about – and above all engages with the wider public. Let’s start the conversation soon, get in touch as you need to get your ideas to us on two sheets of A4 max (email is fine) with CV by 12 noon on 8th October latest. Please note – absolutely no previous experience is necessary to apply for this award, if you don’t even have a CV, still apply! A One Day Artists’ Conference Hosted by Barrington Court Organised by SAW (Somerset Art Works)as part of Scion. Cost: £15 each, £10 for students (Book in advance, pay on the door) includes lunch and refreshments. This is a valuable opportunity for artists and those working within the visual arts to widen networks, share feedback and get advice on practice and projects. Everyone is welcome to attend. The wonderful setting of National Trust property, Barrington Court will enable participants to see the growing accumulation of contemporary artworks as part of the ongoing Scion contemporary art programme. The day will include a curator’s tour of the artworks with Beacon, as well as presentations from Scion’s curator John Plowman; exhibiting artist Louise K. Wilson; and curator-artist duo Amelia Beavis-Harrison and Alan Armstrong. An opportunity for artists to take part will be in a special Pecha Kucha! – a simple Power Point presentation format where each artist shows 20 images, each for 20 seconds. The images forward automatically and the artist talks along to the images, in this way each artist will be able to present their work for 6 minutes 40 seconds. Reveal Innovation award winner Jake Ayre brings his gifting installation to The Engine Room in Bridgwater between 13 – 18 December 2010. Pens, paper, glitter, cardboard boxes, tape and random other items will be available for you to let your creativity run riot and make gifts for the people you love. 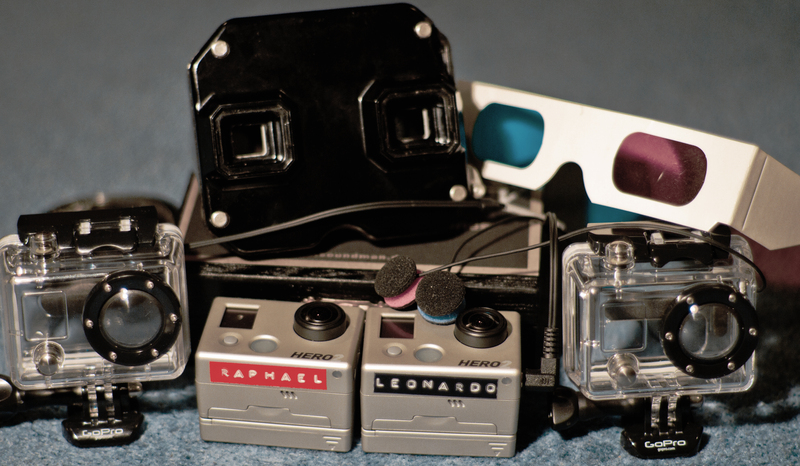 There will be a video booth for you to make your own videoworks. Use the booth as you wish (as long as it’s safe!). Bring in items, tell a story, sing a song, do a dance, the booth is your oyster, get adventurous and make a videowork for someone. You will be able to take your video away on DVD the next day or upload it to youtube for the whole world to see. I will be in The Engine Room gifting people with the same materials listed above. I will also be roaming the streets of Bridgwater gifting people as I fly round town. Offering people seats and sheltering them from the rain, drawing their picture and offering a warm brew to scare off the winter chill. 1. Gift someone else. This gift could be absolutely anything you could make them a card, sing them a song, write them a poem, cook them a meal, give them a hug. No gift can be too small or too big. Just keep moving with love. 2. When you gift them, please tell them to keep the gift moving so they too can share the gifting experience. 3. Go to the web page and place a marker on the map stating what your gift was and where you received it. Experience all the gifts that have been given and received during the project so far and see your own installed if you wish them to be included. See interviews of people who have gifted and been gifted. See me gifting people on the street of Bristol, Norwich, Ipswich and Bridgwater. See video work gifts that I have gifted to the people I have engaged with through the project. Listen to songs and sound works I have gifted to the public. Watch my video blog which discusses what the gift is and how it behaves in Bristol, Norwich, Ipswich and Bridgwater. Talk to me, come and sit down and tell me your experiences of the gift. Tell me what you like to gift people and how often you gift people. Tell me what you think a gift should be. New blog site from Reveal partners at the Engine Room –ignitesomerset.wordpress.com – features interviews with the first Reveal Innovation award winner Jake Ayres as well as with artistsSuMo, Jon England, Kittie Hillier and Laura Rouse.